Pinay girl group 4th Power belted out David Guetta and Sia's "Titanium" for the second round of bootcamp on X Factor UK Season 12. 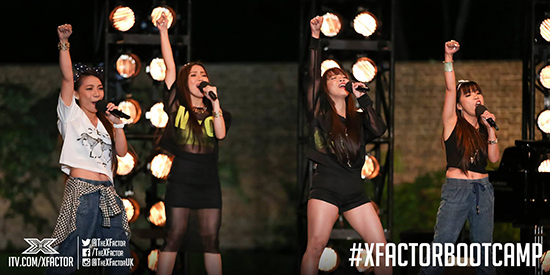 All-Pinay girl group 4th Power made it to the controversial six chair challenge of X factor UK Season 12. The announcement was made on Sunday, September 27, after the second round of the bootcamp at the Grove Hotel in England. The judges/mentors--composed of Simon Cowell, Rita Ora, Cheryl Fernandez-Versini, and Nick Grimshaw--expressed their admiration for the Pinay quartet’s powerful vocals. Before their performance, Cheryl asked the girls about their experiences from the first round of the bootcamp. Before hosting the 12th Season of X Factor UK with Caroline Flack, Olly ended up as the runner-up of the reality-talent competition’s Season 6. Simon was left with a smile on his face after group’s performance but� he felt it “wasn’t as strong” as their first two performances. Rita agreed with Simon’s comment, nonetheless, the “Poison” singer still gushed over their performance. “Definitely it wasn’t but what? Compared to everything I’ve seen so far,” she said. Both Rita and Simon expressed their desire to work with the group. However, Cheryl will now mentor the Pinays singers since she was voted to handle the “Groups” this season. Rita will be mentoring the “Girls” while Nick will handle the “Boys” category. Simon was also voted to handle the “Overs” (those over 25 years of age) category, which he also handled last season. Meanwhile, Pinay mom Neneth Lyons’s scenes from the second round of the bootcamp wasn’t shown on last Sunday’s episode but she also made it to the “Six Chair Challenge” of the competition. 4th Power and Neneth will now have to battle it out with 14 other contestants among their respective categories to secure a seat and advance to the “Judges’ Homes” round of the competition. MAKING AN "IMPACT." News broke out that 4th Power will be renaming their group. An unnamed source told OK! Online that the group is now in the process of changing their monicker to avoid legal issues as another band of the same name made a copyright claim. The source told OK! Online: “4Th Power were in the 6 chair challenge but at this stage in the competition it came up there is an issue with their name similar to that suffered by Little Mix. Before X Factor UK, 4th Power was known for different names. The all-Filipino girl group was previously known as The Cercado Sisters when they joined TV5's Talentadong Pinoy in 2011. They changed their name to The Gollayan Family when they joined ABS-CBN’s noontime variety show, It’s Showtime, in 2012. In 2014, the group changed their name to M.I.C.A. (the acronym of their first names) when they joined the South Korean talent search, Superstar K6.